How-so-ever busy I am on my trip to Jaipur, I never miss visiting Anokhi. It HAS TO be visited. Everytime. Like a ritual. I personally love the collection stocked by their C-Scheme store. It is impossible to come out of the store without buying something/anything. The C-scheme store has two parts. One is the garment-outlet, the other one is a quaint cafe. I used to visit the garment-outlet and wistfully look at the cafe thinking “Maybe someday….”. On one of the visits to the city, I impulsively decided that, that some day is going to be right that day. Even though I was pressed for time, as I had other places to visit, I gave in to my heart’s fancy and headed towards the cafe, post my shopping-spree. It happens to be a quaint little organic-food cafe, sharing the floor with its sister concern Anokhi-the garment store. I entered the area marked by small wooden partitions, denoting the premises of the cafe. The place has a warm, positive and intellectual-elite feel to it. I chose a cozy corner to seat myself. Corner-tables in cafes have something very comforting about them and there are days when any other table just-won’t-do. I was all by myself and needed the peace and quiet. Thankfully, the two other tables that were occupied were not very close to mine. Inside, the display section is neatly divided into snacks shelf and sweet-dish display. 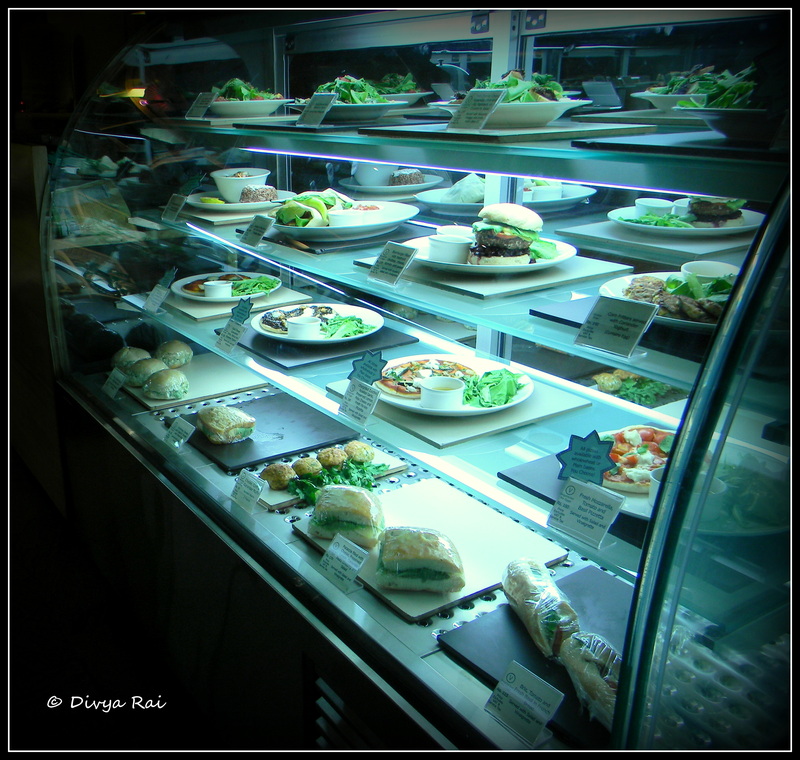 There is a segment for packaged ready-to-eat food available close to the counter. 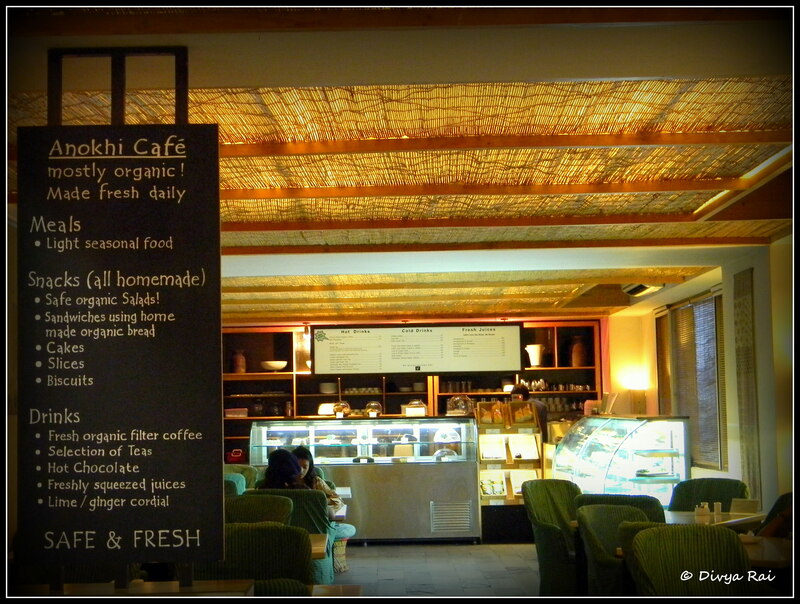 The cafe is known to procure many of its ingredients from its own farm,hence the sign board says- “mostly organic”. 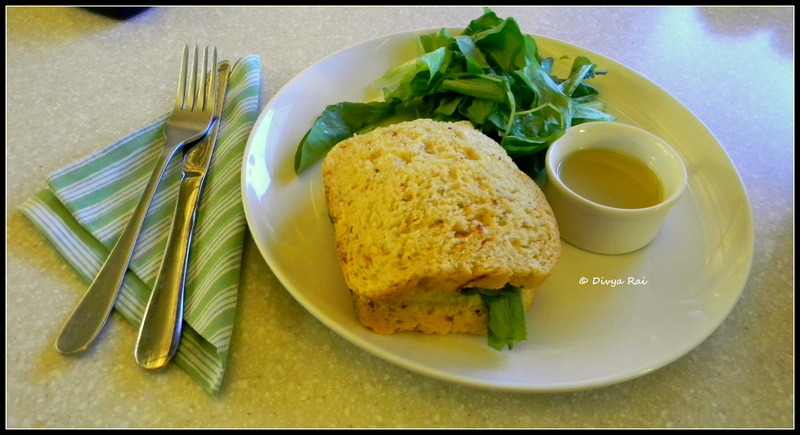 After going-through my options for snacks, I placed an order for “Hummus, Tomato, and Salad in Tomato and Onion Bread-served along with salad and vinaigrette” [So, in a quick glace, it seemed to describe – salad, sandwich-ed in a semi-salad that is served with, well, salad]. These people desperately need to name their dishes better! I paid for my order and requested the man-at-the-counter to get the sandwich grilled or slightly heated. He refused, stating either that they do not do it, or that the oven was out of order. One of these. Whatever it was, I had my sandwich just-out-of-fridge cold. I can have slightly warm hummus but cold sandwiches? Definitely not. Not when I make you a priority in my busy itinerary on a weekend-visit to the city. That dulled my enthusiasm, and I didn’t place any other order. Would I stop by at the cafe again? Maybe I would, but it is definitely not a place I would especially go to hang-out at. I would rather walk to Tapri and have a quick bite, if time permits. How Do You Address Your Husband? The Sole Passenger: My Train Journey On A Diwali Night.